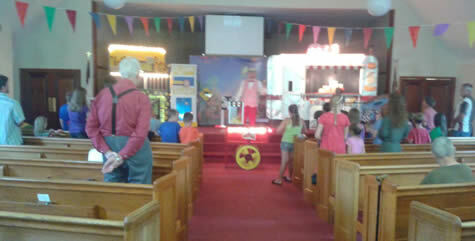 Vacation Bible School is always an exciting and anticipated event every summer! We always have a special theme and tailor the songs, games, Bible lessons, and Scripture memory to match that theme. VBS is a great time of fun for the kids of our regular attending church families and something they look forward to each year. It's also a great opportunity for us to reach out to the children of the Crown Point and surrounding community to share God's love with them. This year's theme was the Vanity County Fair! The Boyle family came and headed up the program for us and they did an amazing job as always. They are such a blessing to our church! With this year's theme being the County Fair the kids were able to bounce in the Bounce House, enjoy petting live animals in the petting Zoo and spending their VBS bucks that they earned at the Country Store. 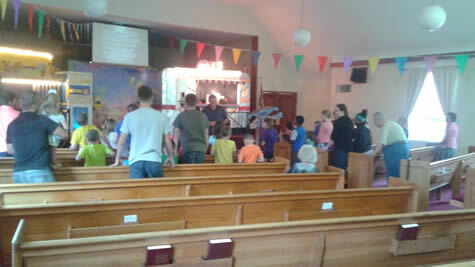 The last night of VBS was parent night, and after the program we had a fellowship with hot dogs, cotton candy and popcorn. Another fun event were the penny wars we held all week. All the money collected will be used to purchase hard back KJV Bibles for the country of Burma. We are also so excited that we had a couple of children saved this week and hopefully some of the children and their families will continue to come to church and to our Kings Kids program on Wednesday nights! Special thanks to everyone who volunteered their time and energy to make VBS 2016 a blessing and success. 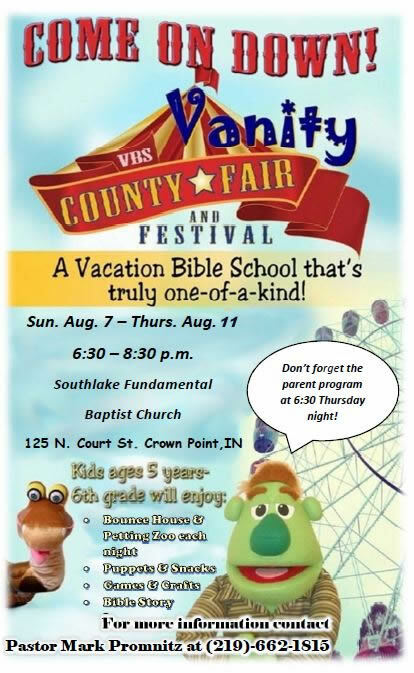 We are already looking forward to next year's Vacation Bible School! UPDATE: We are thrilled that one of the boys who trusted in Christ as Savior during VBS this year, also followed the Lord in baptism the very next month. Praise the Lord! Pray for this young man's continued spiritual growth. Check out our VBS 2017 pics!